If you are still asking yourself who to vote for in Forest and Bird Bird of the Year poll, stop asking ‘Who? Who?’, vote Ruru. “The Morepork is the true kiwi battler. Intelligent, hardworking, honest, noble” Morepork campaign manager Jerome Chandrahasen said today. To show your respect for the Morepork/Ruru visit http://www.forestandbird.org.nz/poll to vote for this most noble bird. Jerome Chandrahasen has contributed 1 entries to our website, so far. View entries by Jerome Chandrahasen. the ruru gets my vote.i look after a 390ha QE11 PODOCARP FOREST IN TARANAKI.i quite often skin a possum & leave it out on the bench at night just to hear the different noises they make.i had 3 of them there one night.quite often they will call out in the afternoon.but usualy only once. “Morepork!” as the Actress said to the Bishop. Morepork, less pastry – demand better pies! Vote Morepork! Leave the two veg to others. I hope this is not a prophetic message on the outcome of the vote! I would suspect a chorus of pain, agony and mild discomfort to say the least!!! The little Lion Bird is also cute and curious. On visiting their territory before dark in January, we are the watched, the strange enormous flightless birds with a variable muted call of “there’sone” or “thereitis” and sometimes “oooh-how-cute”. Their information-gathering techniques consist of sharing investigative sorties and cocking their heads to the side to make more sense of us. On one memorable occasion in near daylight, I was the subject of several reconnaissance swoops within a wingspread of my side from an investigation perch just a few spreads directly in front of me. The Jack Russell was an added curiosity, and he was subjected to a long, low silent swoop as we walked back down the track. Having concluded my own election campaign, I’m ready to throw my support behind the election of our modestly silent and studious mover who lets us know of his presence only to reassure us he’s on the night watch. I grew up in the back blocks of Gisborne and most nights when you were out possum hunting you would hear the MorePork calling her name amongst the trees. Delightful. That entire quote comparing Willie Apiata has made my day. I was going to vote Sooty Shearwater, but I’m a swing voter and I’ve swung. You’ve made a Morepork lover out of me. Ruru is a lone voice from the dark at night. So comforting. Never seen but always there. I just did a presentation a role play to a bunch of people at a ageing and transition conference in Rotorua I called it ” The call of the Ruru” everybody who saw it related their own experiences to the korero as it was based on a old maori ladies life at a time of transition and on her journey her Kaitiaki the Morpork was their calling her – it was a hoot!! the Ruru/Morpork is definately the kaitiaki of our ngaheri/bush always there but hardly seen. On a visit to Tiritiri Matangi, off Auckland’s coast, in January 2011, we saw the most amazing sight. Or rather, we heard the event first! It was about 5pm as our party made its way down to our boat. There was no-one around, and it was very hot. We heard, in the bush, the most humungous cacophony of birds screeching and clamouring. Wondering what it was – and why it was so prolonged – we stepped off the path to see. 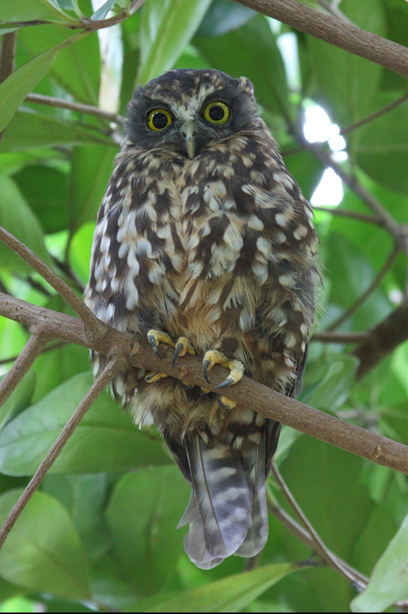 Sitting in the tree in broad daylight was ruru, the maginificent morepork, surrounding by ten to twenty birds of a variety of native species – from saddlebacks, to North Island Robins. They were going hammer and tongs at the morepork, who appeared unperturbed. The other birds kept about half a metre away and were flapping their wings at the ruru and crying out. Perhaps the morepork had popped out to savour the tastes of someone’s fledgling in its nest. Certainly, he wasn’t going anywhere. We stopped for ten minutes, but the noise and activity did not abate. A fascinating experience. And the morepork was looking at us too as much as we were watching him.